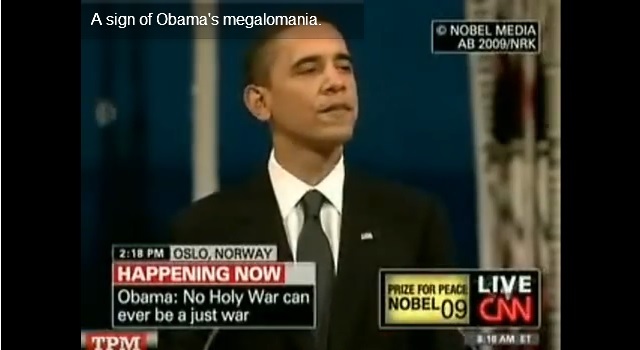 Obama’s Psychopathic Narcissism / Megalomania | Stop Obama Now!! This is a short overview of Narcissism and why some say Obama is an extreme Narcissist or pathological Narcissist, also called an egomaniac or a megalomaniac. The Black Liberation doctrine of Obama’s church of 20 years under Jeremiah Wright is a cult religious doctrine, which holds that the black race is God and that a Messiah will arise from the black race to destroy America. Obama declared in his Nobel Prize lecture that we have a spark of divinity within us. That man has a spark of divinity that he can develop into god-hood is a basic concept of occult religions. At the ten-year 9/11 memorial, Obama reads a carefully-selected Psalm that allows him to hint in public that he is God. Farrakhan declares in 2008 that Obama is the “Messiah.” Black Liberation Theology was inspired by Farrakhan’s Nation of Islam. Both cult doctrines teach that the black man is the manifestation of God on Earth.